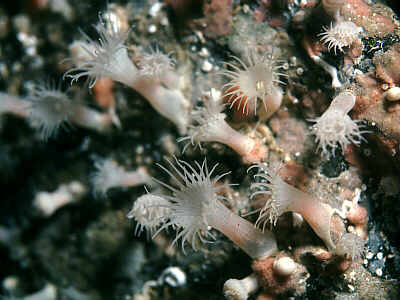 Description: This colonial sea anemone has up to 44 tentacles, the polyps are up to 25mm tall. The colour is white, sometimes pinkish if gonads are ripe. Habitat: Often on organic substrates: sponges, sea-squirts, worm-tubes, dead corals, etc., but also on rocks and wrecks, from 20-400m. Often in dark places beneath overhangs and on the roof of caves. Distribution: Parazoanthus anguicomus is found at scattered locations around Scotland and in deep water around northern Europe, south to Lundy Island and Brittany. Similar Species: See Parazoanthus axinellae for distinguishing features of these two species. Numerous individuals arising individually from thin or thick basal encrustations. 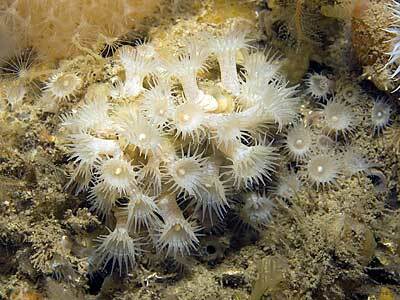 Tentacles pointed, not as long as in Epizoanthus. Picton, B.E. & Morrow, C.C. (2016). Parazoanthus anguicomus (Norman, 1868). [In] Encyclopedia of Marine Life of Britain and Ireland.